Can you believe it’s already September? wow. Where did summer go? I realize that some of you live for the fall season, and I have to admit, it’s always been one of my favorites. Who can deny the onset of crisp, cool evenings, harvest time, days getting shorter making for fun campfires that last long into the evening? Or how about apples that make cider, pumpkins into pies, and the endless tomato creations you can make? Okay, so I think I’m ready for the fall season, and to kick it off right, I’m getting junky with it. tee hee. I’m all about some repurposed pumpkins. 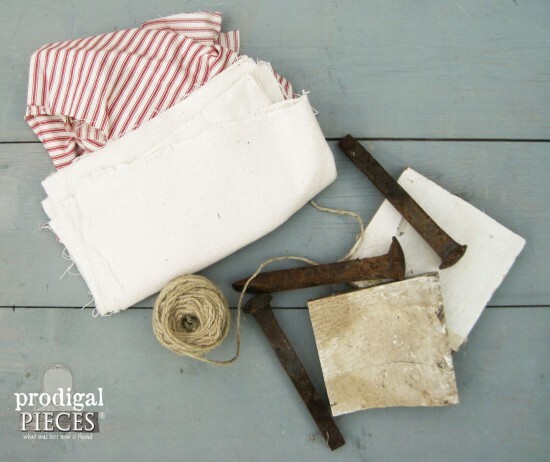 Red ticking, white canvas, barn wood scraps and railroad tie spikes…oh yeah! Do I have you intrigued? I hope so, because it’s fun to create and think outside the pumpkin! 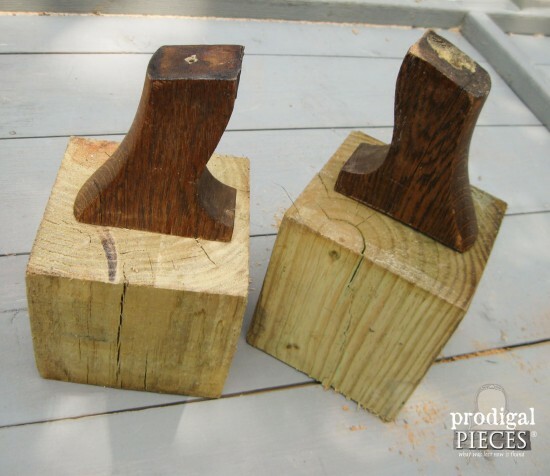 For whatever reason, when I saw that the antique rocker base looked like an animal in this post, I immediately saw pumpkin stems in the scrap pieces. 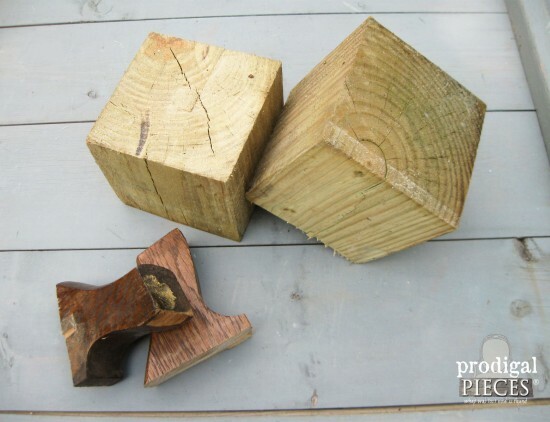 Since we are building a large pergola and had these giant cubes leftover, they just seemed like a perfect match. So, I drilled into each piece and added a dowel to secure, then had myself some chunky funky pumpkins! 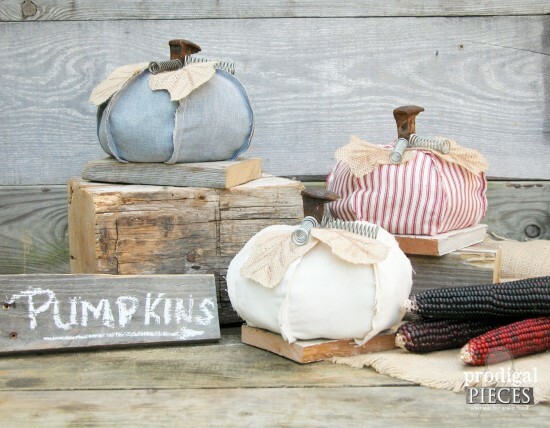 Aren’t these repurposed pumpkins fun, and wouldn’t they look sweet on a front porch or mantle? I think they’re whimsical and, like I said, it’s fun to “think outside the pumpkin”. 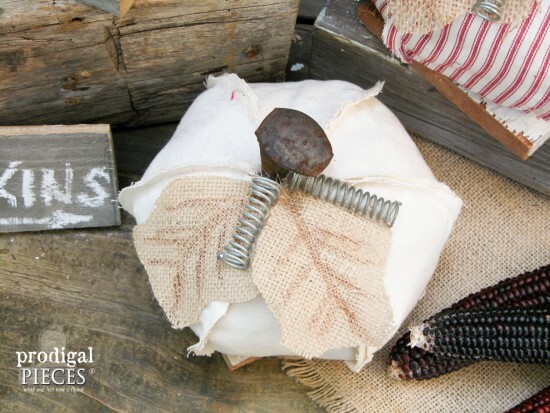 It’s fun use burlap for leaves and twine for vine. The second set of pumpkins involved bit of sewing, but first I had to create a base using some scrap barn wood (much like we did for our bowling ball pumpkin). 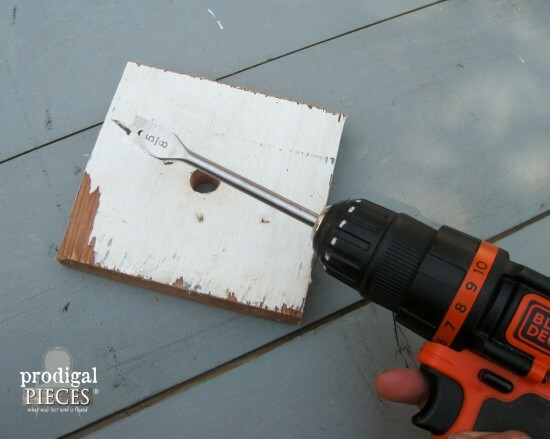 Using my drill with a spade bit, I made a hole to stick a railroad tie spike in. Since I love to sew, I already had an idea of how to assemble the rest. I created a stencil with the shape of an eye, 9″ long and about 4″ wide at the widest point. Cut out 6 and sew. Although I chose to do mine with seams exposed, they could be created with a finished look too. I think these are DA BOMB! I seriously had to hold myself back from making dozens of these. Why not, right? 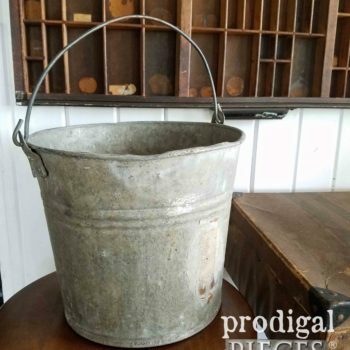 I have a 5 gallon bucket of spikes and bolts just begging for a purpose. perfect. I don’t think I could choose my favorite, but I’m excited I could put all the baby crib springs from my chalkboard easels to use in a funky fun way. The white is a canvas material in resemblance of my favorite color pumpkin. The red ticking is perfect for the season, don’t you think? The blue/gray linen is reminiscent of those awesome blue pumpkins that I aim to grow one day. I had fun with these and challenge you to dig into your stash and create some festive fall decor too! If you’re not in the DIY mood, and would love to have one of these two different styles of pumpkins for your own, you can find them in my shop. 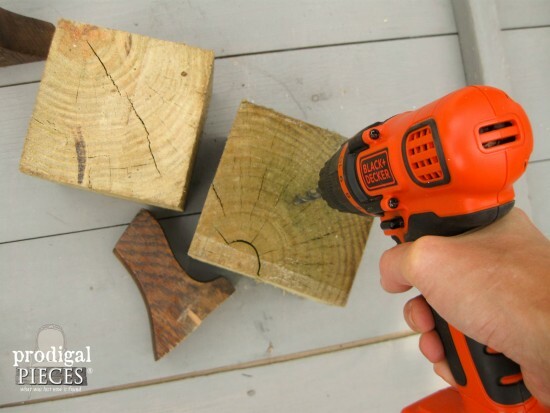 Have fun with it and create your own funky fun decor. You know there’ll be more repurposed pumpkins to come! Nothing like picking your own apples…it’s the best!! Adorable! I love the rusty spike pumpkins. 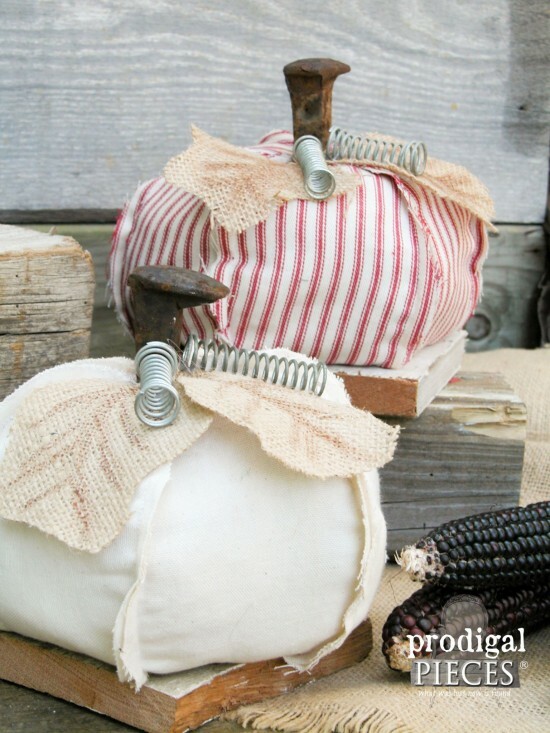 Who knew railroad spikes, rocker parts, springs, wood scraps & fabric would become pumpkins?? lol I love them all! They are so much fun!! It just happened! 😀 Thanks, Sherry, they were fun to make. hee hee…yes, that halloween orange can be yicky for sure. Thanks for stopping by! LOVE these! The red ticking one is my fave. Pinning. Thank you, Beth! I’m sure you gang would love that one too. Maybe be a Queen Creek Address, I’m not sure. They also have maizes the kids can get lost in, and a not so haunted house for Halloween, just for fun. We like to go there in the fall, because there isn’t anything they cant do to make us happy. They even have a chili and cornbread feast! We still have little ones in our family, but even if we didn’t, I believe we would still go there in the fall every year, because it’s become a tradition! Happy Fall, Larissa! Okay…you’re soooo making me ready for fall, particularly the chili part! YUM. Enjoy! Love your pumpkins Larissa! My favorite September fall fun is to simply enjoy the cooler weather and travel to the mountains to view the beautiful fall colors? then in October pumpkin harvesting, carving for Halloween, and pumpkin pies…yum! Thank you, Victoria! I love the colors of fall in all their glory. It seems as if they’re saying farewell. Watching college football and going to the pumpkin patch, of course! Of course! What’s fall without football and pumpkins? Since we live in the deep south we do not have apple orchards to visit and our pumpkins are usually set up in a parking lot since we dont have too many “real patches around. So if I had to pick my favorite Fall activity it would be sittin around a camp fire om a cool night sippin cocoa. Nothing like the smell of a campfire in fall. Nothing like a hot cup of cocoa and a fire….the best! Shared your post in FB…fingers crossed! Not really sure what happened to my first comment tag but I love your fall ideas and have pinned this to my crafts board. 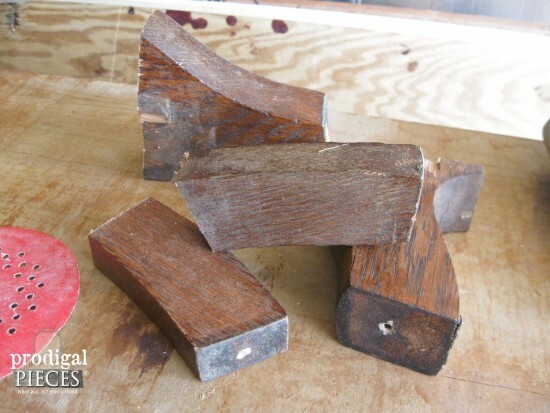 Cant wait to put some of my scraps to work! It’s here…no worries. Thanks for pinning! Larissa, these are awesome! I am ready for fall! Thank you, Maria! Yes, the heat is making me crave it. Bring it ON! 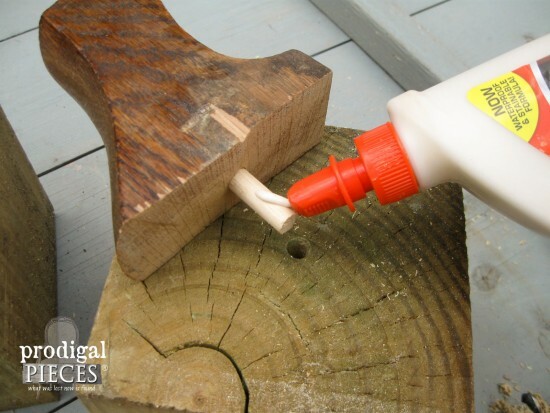 Also, I’m pinning your post! Yes! How fun it is to CRUNCH them. Gotta love Ohio falls! Ok, These are the cutest Pumpkins, such a great idea and they will work no mater what your style is. Thanks for a great post. This is a post that I will be shareing with every one, that I can. My favorite Fall activity is preparing for Thanksgiving. 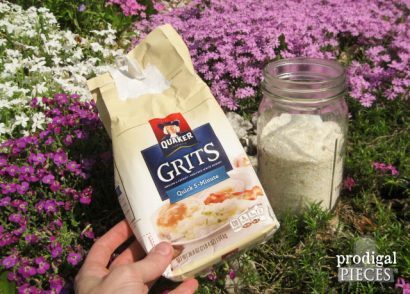 I love decorating the house, baking and cooking for a season of gratitude . Everyone is welcome at my table. Yes, a wonderful time of family, food, and fun. You must have an awesome gathering, I’m sure! Red and white pumpkins? Oh my goodness, that is my dream! 😉 Love them. hahaha…with ticking, you can’t go wrong. Thanks! My favorite fall activity is football (Roll Tide!) and eating pumpkin flavored food! Ha! ? Great job, my friend…as usual! That is what I just so love about nature…anything, and everything goes…! hee hee…you know me all too well! 😀 Make it a good one, Yolanda. 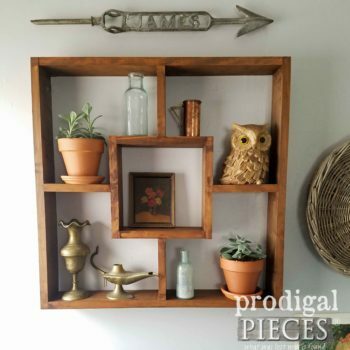 Larissa, you are the Queen of making junk look fabulous! 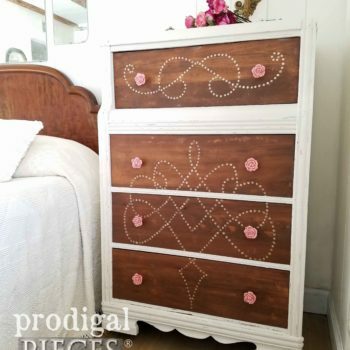 Please, what a creative use of crib springs and railroad spikes (which I have a stash of somewhere around here). As for my favorite part of Fall…ahem…this might boot me right out of the contest entries but I really dislike Fall. I’m a Spring/Summer gal all the way. But if I were to pick one thing about Fall that makes me happy…pumpkin everything from pie to lattes to diy decor. Winning one of your fabulous pumpkins would put a smile on this otherwise cranky Fall face! Bah-humbug then! 😀 My husband is like you and says fall reminds him of how everything is dying. He’s a spring chick for sure. Maybe my pumpkin will change your mind. These are all great ideas….gonna look around and see what I have! This style is right up my alley…lol! THANKS and Happy FALL! In the fall my family loves to go through the corn maze’s!!! Have a bon fire after and cook out. Love the spikes, that’s my fav pumpkin. So fun and scary in the dark! Bonfires, roasting, and long talks are the best. Sharing on my Facebook and pinterest! I’d love to be talking a long walk in the Ohio woods, kicking those beautiful colored leaves and watching the color rain down! I miss OH in the fall! It would be the hardest thing for me to leave, for sure! I’ll take a stroll for you, sound good? Love pumpkin latte, pumpkin bars, pumpkin seeds, pumpkin patch..love anything pumpkin in the fall. 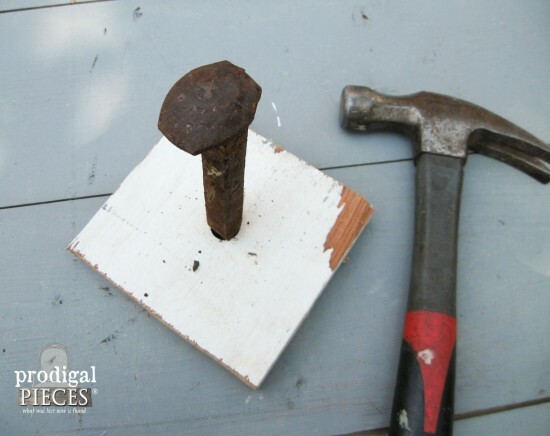 Pinning and sharing? You’re the pumpkin gal! Enjoy the coming season and thank you for sharing. Autumn! I wish we had autumn but living in the tropics means we don’t! My favourite activity is that it finally gets cool enough to spring clean! I know, we live in a crazy upside down world! Sharing your beautiful pumpkins on Facebook …. Love them BTW. Love these! They are all perfect but that chambray blue is pulling at my heartstrings ? Love love love the fabric ones! For fall I love sitting outside with a blanket in front of a fire pit! So relaxing 🙂 Definitely going to pin this and would LOVE to win a cream pumpkin! There’s something about a campfire and cool nights that are just soooo right. I hope you win! Never had one, but hear they are delicious! I can imagine that is a glorious trip. The foliage alone is a show! We just love pumpkin picking!! My favorite for the fall season is picking pumpkins, baking pumpkin pies and carving pumpkins for Halloween. Your pumpkins are so cute! Share your creative pumpkins on Pinterest. Love the cooler weather, and wearing boots and jeans!! Love the bonfires and the crisp air. Mmm hmmm…so fun and refreshing too. Make a great time to snuggle down in a warm blanket and take a nap! One of my favorite things about fall are family trips to different cabins in the mountains of North Carolina. Now that makes for sweet memories, I’m sure. Thanks for sharing! You, my friend, are a creative GENIUS! I love these! hahaha….thank you, Rebekah. I’m so happy you like them! Oh oh oh! I know my favourite autumn activity …. Travelling in Turkey, we are in Pumakkale now! Much more fun than merely eating turkey! I bet! What an awesome adventure…enjoy! These are outstanding! Love them and of course pinned and shared! I like them all but the wood one would look great on my porch . Fall is my season. Ummm…actually it’s MY season. Just kidding. Thanks for stopping by! Eating chili! Fall is chili weather! I pinned this because I love it so much! I love fall! I love baking all the goodies that come with it, chex mix, pumpkin cookies and bread! I also love soup in the fall. Oh and decoration my house, inside and outside. Walks in the woods to see all the colors and smell all things fall. hahaha…ain’t nothin’ wrong with that. Hope you win! I absolutely love all the creative thoughts that were put into making these beautiful pumpkins!!!! Awwww…how fun for all of you. Memories are priceless! I also shared these on Facebook!! They are absolutely adorable!! I love them!! ? I think my favorite fall activity is raking leaves so the grandkids can jump into the piles! Love a long drive seeing beautiful colors! Favorite fall activity — visiting the pumpkin patch and carving pumpkins!! My favorite fall activity is going to our church’s annual harvest party. It is a potluck gathering with all the wonderful tastes of the season. There’s always a football game for the young at heart and a hay wagon ride. Favorite fall activity? Ooooo hard to chose just one – I love looking at the colorful trees, smell burning leaves, making apple pie, wearing sweaters, making soup! All things fall are all good in my book. Love your activities! I love your pumpkins! I posted them on my board called Thanksgiving on Pinterest. Thank you! They were fun and got me in the mood for the changing seasons. the pumpkins are so cute love the cloth ones, fall is so fun, cooling down, changing of leaves. Couldn’t agree more. We’ve had high temps that are unusual for our area this time of year, and I think I’ve had enough. Thanks for stopping by! tee hee. Thank you, Julie. Hope you win! We love to pick apples and then make apple sauce, apple pies and taffy apples. I love all the pumpkins. One of my favorite apple foods is Apple Jack. Ever had it? Much like apple pie, but in bar form. I love the Fall when the temperature finally begins to cool down and the leaves start to turn. My favorite thing to do once the weather changes is to gather up friends and family for a weekend camping trip. Campfire cooking & toasted marshmallows! Hard to beat! Sounds like good times in your neck of the woods, Nancy! Nothing like it, right? Do I get sympathy points for misspelling my own name in my first post? 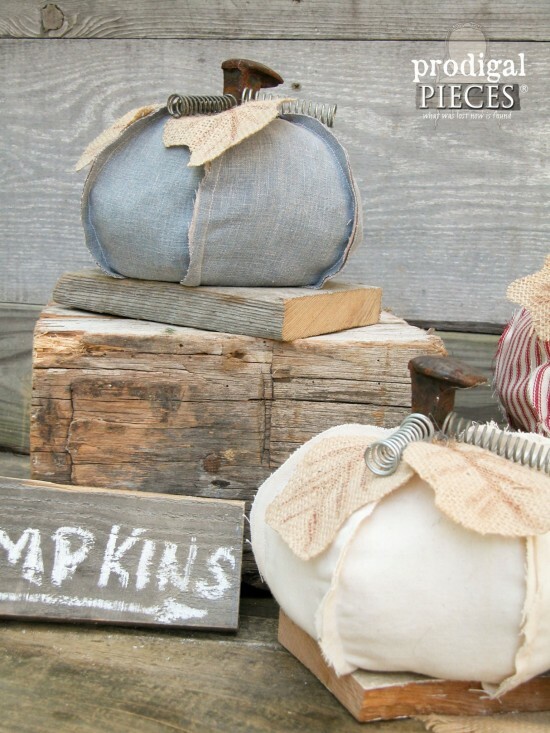 I’ve pinned the adorable pumpkins to Pinterest; my favorites are the red ticking one and the rustic orange block one. Loving your pumpkins! My favorite thin about Fall is Pumpkin everything! And then jumping in them! There’s just a whole lotta good about it, right? Thanks, Sandi! The Great pumpkin Charlie Browns . I like them all. Walking outside, taking in the smells and sights. Baking too! Yessss…long walks in crunchy leaves with a nip in the air. Love the little pumpkins. Your blog and FB page are really fantastic. 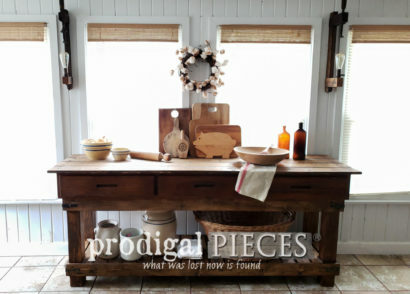 I really admire how you have a vision for an old beat up piece of vintage décor and bring it back to new life. Keep up the great work !!!! I think that one and the blue are my fave, but have a special place for the wood ones too. 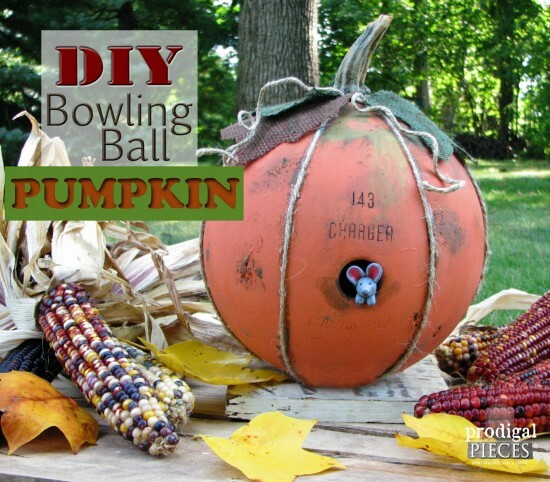 I’m going to be seeing pumpkins in every piece of junk I around! These are so clever! Love them. 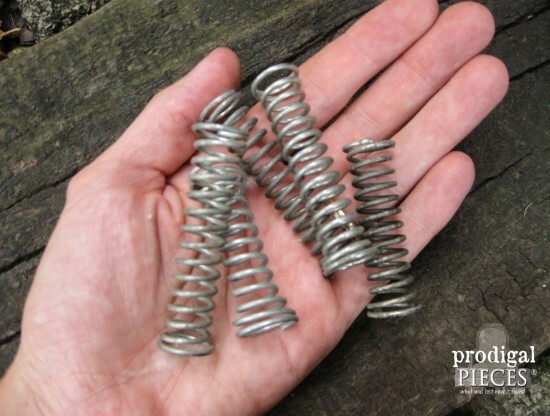 Love them all and the springs are the perfect finishing touch! 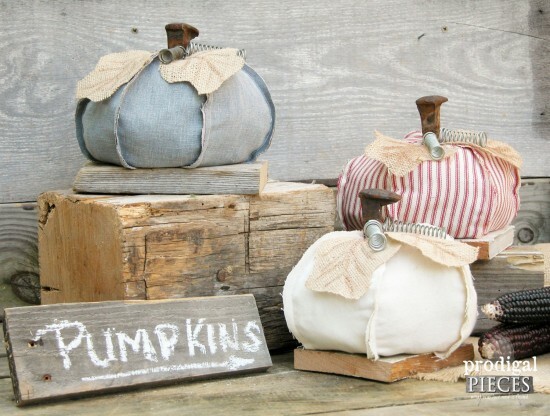 i love the fabric pumpkins! I’ve been thinking of ways to add reusable fall decorations into my rotation instead of always buying pumpkins and then watching them rot. I’m going to make these a staple in my decorating. 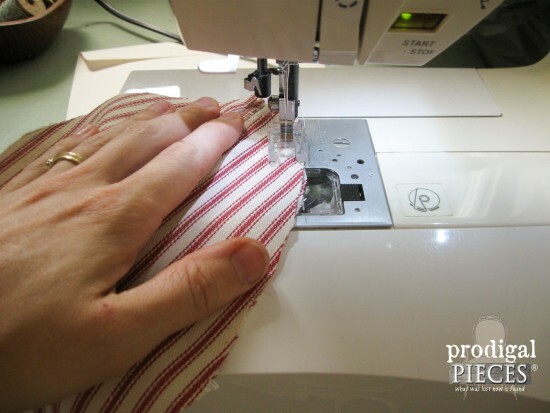 I have the red ticking fabric already, too! Thanks for sharing! 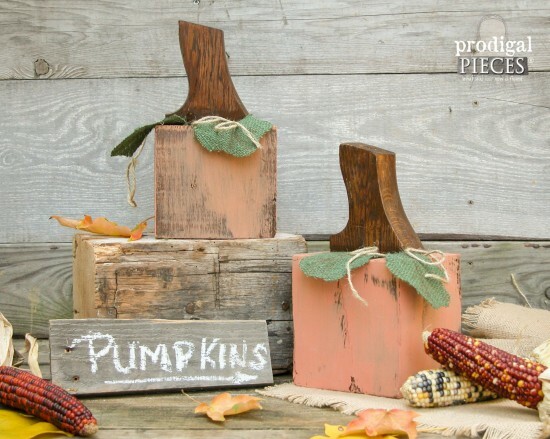 I LOVE those railroad spike pumpkins! My husband worked for Norfolk Southern Railway for years and we love everything railroad. 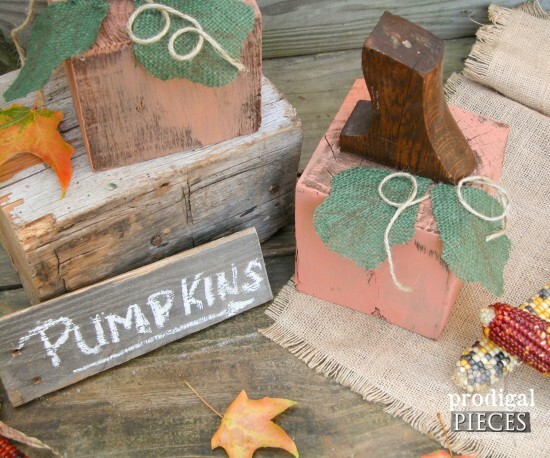 How cute and creative to put the spike in wood and surround it by a fiber-filled pumpkin fabric. 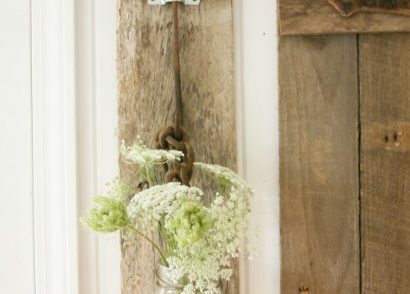 Love the burlap leaves and twine vines! (Say that 3 times!) I think you are so very clever. Keep this good stuff coming! So happy to hear it, Barbara! I bet those spikes create an awesome memory for both of you. Thank you for the love! You never cease to amaze me with your creativeness!!!!! I love these! Thanks! Yes, I am very organized with bins, boxes, and such. May be a bit crazy to some, but I know where things are. haha.